Frozen has quickly become a new favorite with Disney fans. You know this means I had to create a new Disney Party Board!! Hope you enjoy it!! Popcorn Snow Balls - It doesn't get easier than opening a package of perfectly done popcorn balls and stacking them on a platter. No one has to know you didn't make them yourself. Snow Capped Arctic Punch - Found this idea at The Bump. Love the way the vanilla ice cream on top of this blue punch looks like snow melting on top of an arctic lake. White Serving Platters - I like serving my party food on white platters in general, but for a Frozen party it is almost mandatory. I would cover my food table(s) with a teal blue table cloth to make the white trays pop. If white is not your thing, silver or clear would work as well. Winter Branches - I love these white spraypainted branches from Hostess With The Mostest. If you want to add a little winter sparkle sprinkle a little glitter on them before the paint dries, or rock salt would work for a icy look. This is an inexpensive but beautiful way to add the feel of a Frozen land to your party. Anna Costume - Nobody does a better job with costumes than Disney!! Whether your birthday girl is an Anna fan or Elsa fan you can find the perfect costume at the Disney Store retail or online. Elsa Costume - While you are visiting the Disney Store be sure to complete your costume with the perfect accessories. Sven & Olaf Cake - Yes folks, this is a cake!! It is amazing - That's Nerdalicious shared this cake created by Sweet as Sugar Cakes for Bake-A-Wish. If I could grant myself a skill, I would want to be able to make cakes like this! Cheddar Cheese Snow Balls - We've all seen these at Walmart - now you have your excuse to buy that great big barrel of cheeziness. Olaf Cupcakes - Spoonful has done it again! They are one of the first places I go to for Disney character food ideas!! Snow Flake Pretzels - I found these online at Crate and Barrel, but I saw them just yesterday at my local Walmart. Little touches like this help really bring the party together. 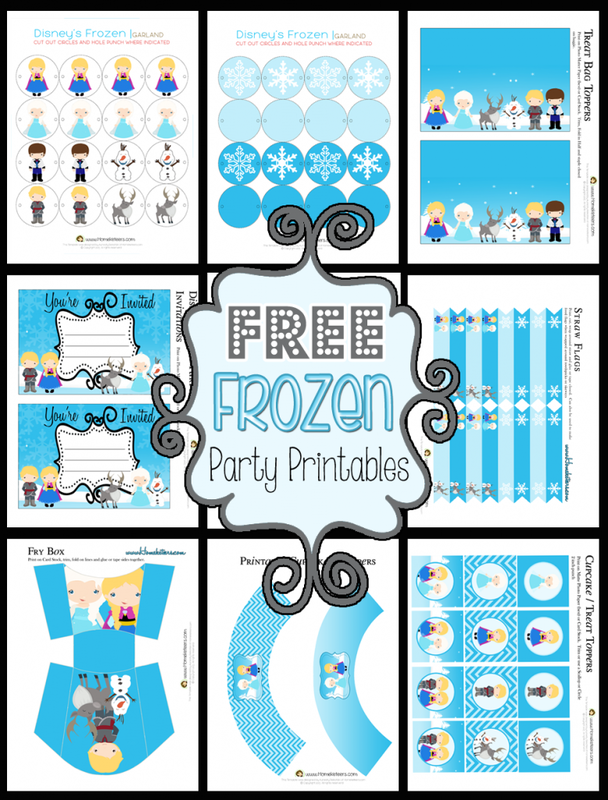 Frozen Party Invitations - I found these at the Etsy shop TuKitDesign but there are lots more to choose from there. You are sure to find one that fits your tastes. 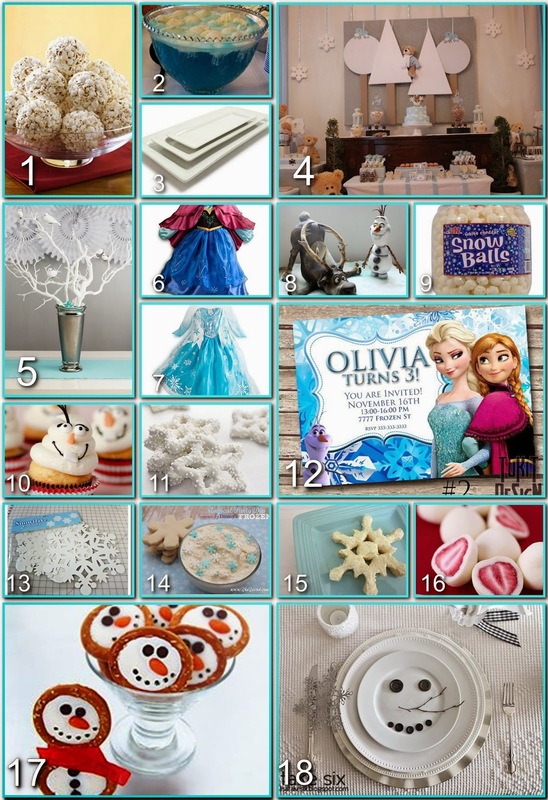 Snowflake Placemats- In My Own Style used these cut outs as placemats, but I think they would look adorable as accents on your food table, especially on top of a teal blue table cloth and the white platters from #3. Magical Party Dip - She Saves was inspired by the movie Frozen to create this yummy Magical Party Dip served with sugar cookies. A nice change from the traditional savory dips. Snow Flake Sandwiches - The snow flake sandwiches from Food Chics are adorable and you can choose the birthday girl/boy's favorite filling to make it personal. Anna's Frozen Hearts- The heart shape of the strawberries along with the frozen yogurt coating make them a wonderful addition to your Frozen party. Be sure to stop by Dairyspot to see how to make them. Olaf Pretzels- I love these adorable snowmen pretzels from Hungry Happenings. They would be a great take home treat for the party goers too. Olaf Place Setting- This place setting from TakeSix is adorable and with just a couple of changes can become Olaf. Exchange the twig for a baby carrot. Use M&M's for the mouth and Mini Oreo's for the eyes. Of course I do not recommend using your fine china for the party just substitute white disposable plates and silverware. I love some Hot Cocoa!! 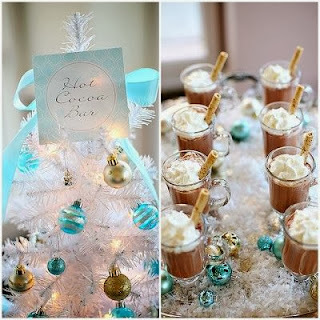 This Hot Cocoa Bar from The TomKat Studio it is a perfect addition to a Frozen party!! Be sure to follow the link for some fabulous ideas for setting up a hot cocoa bar for a treat your guest are sure to love! 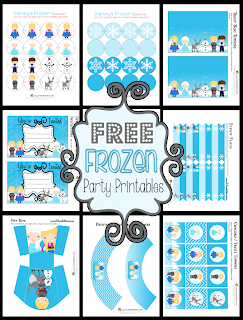 Be sure to get these Free Frozen Party Printables from Homeketeers!! A cute and FREE way to add to the party fun!! Just a couple more things, add shredded coconut to your platters for a great frosty look, and place silver and blue Christmas ornaments around the party to add pops of color around the room. Be sure to send me pictures if you have your own Frozen party (disneydonnakay@yahoo.com) or post them to the Disney Donna Kay Facebook page. I'm totally going to use #18 the Olaf place settings for my Frozen Adult Dinner Party ideas. Thanks Kuleen! I love planning these parties, and especially love it when my Disney blogging friends stop by! AWe, thanks Didi! It means so much coming from you - you're the best! !